Straight cut wires are produced from cold drawn steel, the wires are hot-dip galvanized or pre-galvanized finish. Cut to desired length for rebar installers, fence installers, distributors and concrete construction contractors. Wire diameter: 0.30mm to 5.50mm. Materials: Galvanized iron wire, soft black annealed wire, copper wire, PVC coated wire. Small pack sizes that can be used by designers or retailers. Efficient in anti-corrosion and anti-rust. Thick zinc coating, good corrosion resistance, firm zinc coating. 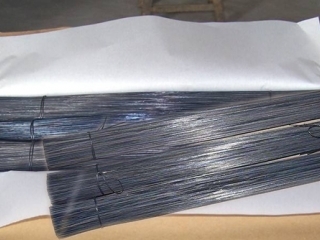 0.7mm Powder Coated Galvanized Straight Cut Iron Wire.